Indio Casino is an online casino catering to Indian players, and it provides potentially the best alternative for all players from this Asian country looking for some gaming excitement. This is particularly true after the recent upgrades the casino has implemented, re-branding their site and offering even better incentives for their customers. What's on Offer at Indio Casino? Indio Casino now features a stylish, modern design, guaranteed to impress even the most experienced casino players. The casino offers access to 200+ different casino games, including slots, roulette, blackjack, baccarat, and more. The games are provided by Playtech, one of the leading suppliers in the casino industry, so players get to enjoy some very popular titles, including the progressive jackpot Monty Python's Spamalot slot, Age of the Gods, Cinerama, Tropic Reels, Golden Tour, and more. Games can be accessed through the browser or via the downloadable software, so players get to enjoy Indio Casino the way they prefer. Funding your casino account and withdrawing your winnings is also as easy as it gets, as all popular methods like Visa, MasterCard, Skrill, Neteller, Paysafecard, and wire transfers are offered. 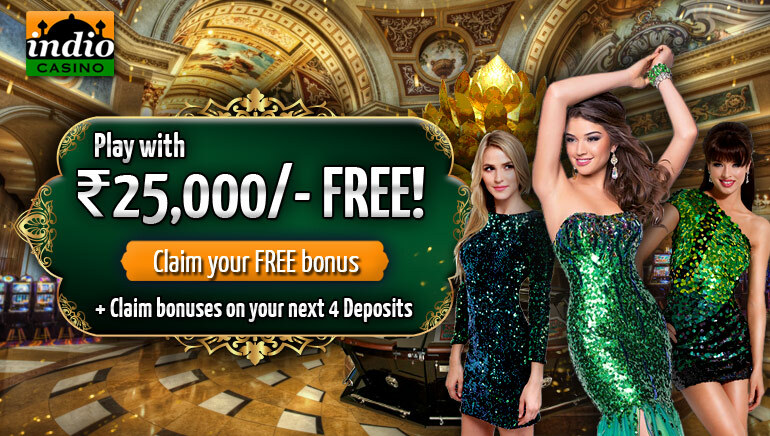 Those signing up for Indio Casino for the first time can claim the first deposit bonus up to INR25,000, and there are additional bonuses on the next four deposits. This will give you a lot of free cash to test your luck and try to score big. Bonuses come with player-friendly wagering requirements, and with so many games on offer, most players will find the task of meeting the wagering requirements quite enjoyable and will get there without even noticing it.